The cheap one that wins our vote for "buy again"
Inspired by my blog post from the end of September, and by the need for me to revise my critical tasting skills for an upcoming blind tasting test, we've been comparing cheaper and more expensive versions of the same grape to understand what the price/value curve is all about. Is there a <£6 wine out there that is drinkable given it probably contains less than 50 pence worth of wine? 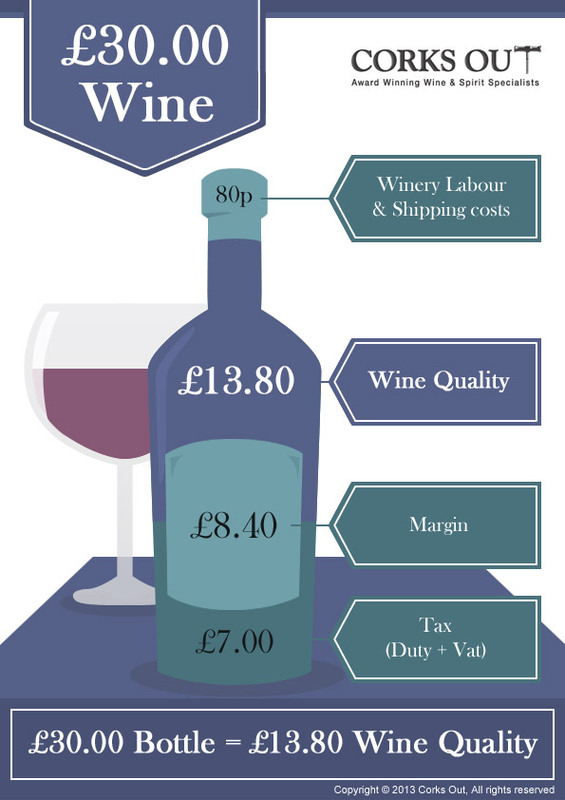 Are wines over £15 really worth what you're paying for them? So this "wine of the week" has turned into more of a "wines of the month" type experiment, resulting in me sampling some surprising wines, and I apologise in advance that this post is a little longer than usual, but hopefully you'll find it's worth it. My first wine in this series was The Wine Society's Southern Spanish Red (2012) from Jumilla. If that wine region sounds familiar to you, it's because we've featured it quite a lot recently, with several of Juan Gil's wines getting a mention. My friend Lory is a real fan of these wines and I'd love to hear what she'd think of this one. At £5.25 it's an excellent value choice for a Monday night wine. Of course, We shouldn't really be drinking on a Monday night, but did I mention my competitive tasting exam? Based on the information from Corks Out provided in my earlier blog, the wine in the bottle contributes less than a pound of the value. (The Wine Society claims to be non-profit making). At this price, there's no time or money for oak aging, but the wine is no less drinkable for it. The grape is Monastrell (which is the Spanish name for Provence's Bandol AC specialty, Mourvèdre) and is probably not one that's in abundant supply on your home wine rack, although if you drink Chateauneuf and other Southern Rhone wines, you'll be familiar with it as part of a blend. Maybe it's time you tried it on it's own. Dry, but with rounded tannins which don't feel cheap, unaged or grippy, this has a medium body and a full, deep flavour of dark fruits and spices. Yes, it's got a short finish, but if you just need something to get you through the latest disasters on Eastenders, I'd condone a bottle of this. If you like a big Shiraz but feel it's too heavy for a mid week tipple, give this a go. I'm definitely going to buy more and am delighted that the experiment has found it's first bargain! In Spain it's usually pretty clear what your extra cash buys you: age and oak. So for our comparison, we bought Carta Roja Monastrell also from Jumilla from 2006 (£9.99 from Sainsbury's). It's a Gran Reserva meaning it's spent significant time in small oak barrels - at least 18 months of its at least 5 years mandatory aging. At 6 years older than the cheaper version, this one feels more medium bodied but has a much longer finish. I'm not sure there's much more complexity of flavour, but the deep dark fruits have been replaced, or is that overshadowed, by more spice, a bit of leather perhaps, and yet somehow it seems more subtle. Interestingly, the Wine Society cheaper version is probably our favourite of the two and that was not supposed to happen. When we first tasted the lower price wine, it seemed deep and dark, but comparatively, drinking these side by side, it seemed brighter and fruitier. Although the Gran Reserva is delicious, it really needs food and we drank it late in the evening, long after our meal. The youthful exuberance of the cheaper version is also more apparent by comparison than it was on the first tasting. Mr Purple Teeth didn't enjoy it so much on the second evening though I didn't really notice a difference. Next, I'd planned to go for a nice basic Merlot and try a Bordeaux merlot, but my attempt to do this with Concha y Toro's Casilliero del Diablo Reserva Merlot (between £5.99 and £7.99 dependent on supermarket special offers) was spectacularly unsuccessful. We opened the Chilean wine on a Monday night after my trip to Warsaw. There, I'd drunk only basic Chardonnay and vodka (apart from the one glass of Georgian wine mentioned in my recent post). So I was really looking forward to a glass of red. But after a few sips, this wine had us reaching for the chocolate instead. Was it faulty? I couldn't say for sure, but it definitely wasn't nice. We opted for a night off the drink, and I went back to it the next night in case it just needed time to "open up". Sadly there was still a very unpleasant bitter, woody/musty flavour (maybe some kind of cork taint?) alongside lush red fruit and plums. I am very disappointed as it's not the cheapest wine out there but it was so unpleasant I won't be giving merlot a chance for a while... That said, I noted that my friend Richard had brought a bottle of this along to a recent dance evening and it was in a screwtop. Perhaps this means the chaps at Concha y Toro have recognised the challenges with the cork and opted for a closure meant for wines destined to be drunk young. And so it was with our Merlot Fail, that we opted to taste 2 Cabernets side by side... Cabernet Sauvignon doesn't get an outing very frequently in the Purple Teeth household. It used to be a firm favourite of Mr PT but times change, and I was never a huge fan. We started with Gallo Family Vineyards (2011) Cabernet Sauvignon which, coming from the sun-drenched Central Valley region, has been commended at the International Wine Challenge, and is £6.99 at Sainsbury's, Waitrose and Tesco. I really wanted to dislike this wine. Firstly it was Cabernet, and secondly, it is absolutely mass-produced with little of the romance a winery suggests, with the Gallo "family" being California (and thus America's) biggest wine exporter, owning a number of brands including that other supermarket favourite "Barefoot". I believe they produce more wine than the whole of Australia! Still, that should mean they're good at it. Mr PT, the Cabernet fan, found it simple yet velvety, with low level of drying tannin and smooth dark fruit flavours. He found it a one hit wonder in it's simplicity but, would have it again at the bargain price. The other wine to question my membership of the "I hate Cabernet club" was the Frog's Leap 2009 from Napa Valley (Rutherford). I've enjoyed Frog's Leap wines before and I'm a sucker for Napa Valley which really is the home of Cabernet Sauvignon outside of the Bordeaux region... At £32.99 a bottle, It's certainly not one I'll be drinking every day. This was just released about a year ago and my senses tell me it will be even more awesome (and a good deal more expensive) in a year or two. It's a pity I only bought one bottle from Alfred the Grape and they've now sold out, as I reckon it's worth holding onto this wine if you have some. Strictly speaking it's not a like for like comparison, because it has 11% of Cabernet Franc in the blend, but let's not split hairs. It has the same sunshiny core of juicy blackcurrant, but it also has loads more toasty character coming from oak aging as well as blueberry and cocoa. I'm advised by their website that it spent 24 months in 2nd use French Oak. It's interesting that an American winery chooses French rather than American oak. Are they aiming for an old world/Bordeaux flavour? Oak in its second use will decrease the impact of tannin extraction from the wood, leaving those lovely toasty, smoky, cigar box flavours on top of the juicy fruit. American oak tends to impart more vanilla, coconut and sweeter notes and this wine is juicy, fruity and sweet enough not to need that. I declare it a hit, but will confirmed Bordeaux fan, Mr Purple Teeth think it's worth the money? Yes! Initially he felt it may be a little too elegant for his tastes, as he tends to prefer a firmer tannin, but with further sips, the tannins reveal themselves as velvety and smooth, yet definitely present. Imagine running your hand against the nap of the velvet... This is a wine to love, one to bring out on special occasions (such as when you're managing to have dinner with your husband for the first time in a fortnight). Our Corks Out guide suggests that this wine will have around £14 of real wine value in it - twice what the taxman takes at £7. Only you can decide whether you'd rather have 4 or so bottles of the Gallo Family Vineyards' Cabernet compared to one of this. I believe there is a place for both on your wine rack. Being very much a Shiraz household, Syrah from the South of France is my final Price Challenge comparison. I selected 2 wines from Waitrose, one at double the price of the other, and enlisted the help of a large number of wine chums in deciding whether you really can "taste the difference". Ten tasters (plus little old me) sampled the two wines blind, side by side. The things I do for you, the reader! First up was La Châsse 2012 (12.5% abv), which I purchased for £5.59 at Waitrose, a couple of weeks ago. I believe it's now gone up to £6.99. As an International Wine and Spirits Challenge Silver medallist, I felt I was giving the cheaper wine a fair chance of success. This is labelled as Vin de France, meaning that despite the label's claim that it comes from "the finest vineyards in France", it doesn't qualify under any designation of origin status, not even Pays d'Oc (the largest protected name zone in the area). Still, some of the best wines being made today (eg super-Tuscans) have eschewed the constraints of the appellation rulings to create something memorable. I won't compare this to a super-Tuscan, but it is a cut above ordinary table wine. It's got bright acidity, tons of red fruit, and a hint of spice. At this price, I'd probably choose the Monastrell or the Cabernet, and that surprises me. But did our tasting panel agree? Descriptions from our blind tasting panel (and written anonymously) included "light for Syrah", "not special", "watery finish", "bland", "smooth", "sharp, thin, I don't like the nose"; "fruity and peppery", and a much more favourable, "very drinkable, could take a bottle home now". On day 2, Mr PT continued not to like it, showing he's not such a cheap date as he used to be. I felt it was drinkable with food given good spiciness and juicy acidity, but it lacked some punch and I definitely won't be buying it again. On balance, 3 of our panel of 10 preferred the cheaper wine without knowing which was which, and perhaps it would improve with age. The label claims it will keep for 4 years, though I wouldn't be tying up my limited wine rack space for this. Our second Syrah for comparison purposes was £11.59 at Waitrose when I bought it - thinking it would interesting to see what double the price buys in France. I'd selected Pierrick Harang's Cuvée Balthazar 2011 (14% abv) from the Pays d'Oc appellation. The label claims it's grown around La Livinière (a premium site for Minervois), though clearly it doesn't fit the appellation exactly or they'd have taken the more premium name. In the glass this was instantly darker and deeper, with a nose of darker fruits and violet which followed through onto the palate. Smoother and less spicy than some syrahs, I jumped to an immediate preference for this one, which seemed more complex. 7 out of 10 of our panelists agreed with me. Here's what they said: "more tannin and blackcurrant", "rich, sharp and fruity", "smooth, medium-bodied, medium tannin", "scrummy with a nice nose and easy after taste", "fruity with a creamy feel" , "better nose, heavier weight, but not too sure on the after-taste". But not everyone was in love with this wine: "Tastes of fruit juice - no peppery taste; smells sweet"; "This is a marmite - sweet, jammy and didn't like it - I would only drink it with balsamic vinegar!". So you can't please all of the people all of the time. On balance though, it seems that the more expensive wine has a better chance of success at your table, and hopefully our many descriptions will help you decide which one to buy. Perfect Friday Wine? 9/10 cats preferred it. Footnote: I can't claim to have gathered 10 wine experts simply for the benefit of you, dear reader. My fellow wine blogger, Perfect Friday Wine's Jo, had assembled the group to help decide on the wines she's planning to sell in the run up to Christmas. Knowing that they'd mainly be from the South of France, I jumped on the bandwagon and assaulted the tastebuds of her guests. Many thanks to everyone who took part and to Jo for letting me muscle in! She had only one 100% Syrah in her tasting selection, and all but 1 of our panel actually preferred Jo's choice, which was Villa Blanche 2012 (13.5% abv) by Calmel Joseph (another Pays d'Oc wine). Jo kept the panel's tasting notes for this one, rather unsurprisingly, but as she's likely to be selling it for at least £1.50 less than the Balthazar, you might want to get on her mailing list for when it comes on sale. I was lucky enough to take away the remains of the bottle and the day 2 tasting says the label is right, it's well balanced with an elegant mouthfeel, and also a hint of that violet and spice, nestled in a bed of dark fruits, though it was definitely much nicer on day 1. My advice is, share it with a friend or two and finish it on the day of opening. Overall, the results haven't surprised me. Spending a little (or a lot) more, has brought more interesting wines from the same region. However, I've been surprised by finding both cheap and expensive cabernet to enjoy, and shocked at loving a wine at £5.25. Good old Wine Society! I'm off to buy some more of that before it sells out, as these things often do when I recommend them. Do you agree? Would you rather 2 or 3 cheaper bottles of adequate wine, or one bottle that's markedly better? I'm going to continue the experiment with white wines next, though I may also compare different regions.. I'll report when I have the chance to sample a fair selection. I may be some time. Have you seen the weather?! If you've any suggestions for splurges or bargains, I'd love to hear them. Meanwhile, whatever you spend on your wine, enjoy it sensibly with food and friends. *** Warning! The Purple Teeth rating on all of these wines is HIGH. Buy your whitening toothpaste now, and alert your dentist. Rauzan-Segla - a Margaux Grand Cru 2nd Growth (1855 classification) isn't the average sort of wine Purple Teeth opens on a Tuesday, but then, this isn't your average Tuesday. There's a wild thunderstorm outside, and I've got my WSET scholarship contest on Thursday, so this is hubby's attempt to "help with my homework". Yes, he loves Bordeaux. I never really thought that at 40-something, I'd be trying for a scholarship. But since giving up my corporate career a year or so ago, all kinds of things I'd never have expected have happened, including coming out in the top 1% of WSET advanced students last year... maybe liking Bordeaux could happen? So back to the wine. Mr Purple Teeth is a huge fan of left bank Bordeaux wines, and he claims this one (average £45 a bottle from independent retailers - this probably came from Selfridges some time ago) is one we should both love. This is 53% Cabernet Sauvignon, 40% Merlot, 7% Petit Verdot. None of these are grapes I crave, though I did enjoy the recent comparative Cabernet tasting we did. Mr PT wants to climb inside what he describes as a blackcurrant cigar box. "This smells of age". I try to translate this into the vocabulary I'll need for Thursday - developing nose, potential for further aging, elegant and velvety tannins, medium + body, high acidity. But yes, blackcurrant and blackberry, vanilla, leather, cedar, and smoky toasty notes. Remind me again why I've been avoiding Bordeaux? There's no doubt about it, this is a classy, full-flavoured delight. And yes, I'm loving it as I write this, though I know there are wines at half the price that I could drink without having to wait 10 years for them to become this interesting and tasty. Nevertheless, if Bordeaux is your bag, I will happily share a glass of this with you. Now, can the examiners please bring this on Thursday morning? I promise I'll go back to studying soil type, climate & pruning methods meanwhile. Cune Imperial Rioja Gran Reserva 2001 has been sitting on my wine rack since Christmas. I tasted it during my WSET course a year ago, and today, I went back to the wine school for an interview. Nostalgic, I opened this before dinner, looking forward to sharing it with my husband. It's not the first time we've drunk it and this was the wine which finally convinced my husband to leave the "I Hate Rioja" club. Excitement built. And then, I sniffed the cork. It didn't look quite right. A bit too dark? I poured some into my finest Riedel glasses. I nosed it. There was something wrong. I'm not going to say the wine was faulty. But it didn't seem right. An hour or so later the faint hint of "just opened/cork taste" had faded, and when paired with food, it turned out to be a highly enjoyable wine, full of deep dark flavours of spice and leather. In fact, by the end of the evening we'd have happily opened another bottle, had we had one. But where was the Tempranillo fruit? In short, it had all gone. I'm the first to admit that my wine storage at home is less than optimum. We chose a small apartment specifically so that we could still afford afford to enjoy the finer things in life, do the things we love and buy the more expensive wines to enjoy at home. I'd been given this wine for Christmas though, and under the circumstances, I really ought to have enjoyed it then. A wine of this age, even one designed to be aged for 10-15 years, is going to deteriorate quickly if not stored in the ideal conditions. Even if you do have ideal conditions at home, if you have a bottle of this on your rack, I'd recommend drinking it now - this wine hasn't got anywhere left to go, and when it's gone, it's gone. Indeed the Wine Society are currently selling the 2007, so it nearly has all gone. Hint: if your wine is stored in your centrally heated home's kitchen, you don't have it under optimum conditions either. The best you can do is keep it well away from temperature variations, out of direct light and ensure that all wine with corks is stored horizontally on a wine rack (and not for years in the fridge either, as that can cause corks to fail too). In short, I'm all for spending a decent amount on decent wines. But I want to remind you, wine is to be enjoyed not admired from a distance. Don't let it pass it's best unappreciated and gathering dust. I for one will be polishing off the rest of what's on my "top shelf" in the not too distant future. And here endeth this particular wine lesson. Dancing has taken me all around Europe, and this month it was my second trip to Poland for Warsaw Swing. After my last trip, I hadn't really expected a gastronomic delight, but that's where my American friend Heidi comes in. Imagine my joy when she advised she'd found a Michelin recommended restaurant based in a former wine cellar, which once housed some of the world's finest wines. And when she told me she'd got us reservations for just before the dancing started, I knew this was going to be a rather different dance weekend. Fukier is right in the main square of the old town and claims to be the oldest restaurant in Warsaw with a history dating back to the early 16th Century. Although mentioned in the Michelin Guide, I don't think it is "starred", yet it it seems to be the haunt of visiting famous people from George Bush, and Roman Polanski (pre jail) to Naomi Campbell, Henry Kissinger and royals, the Queen of Spain and our Princess Anne. And now Purple Teeth! The online reviews led me to fear terrible service, something I wholeheartedly dread, but aside from it being a tad on the slow side of relaxed, I found the staff friendly, well-informed and helpful. We experimented with a number of dishes. Sharing appetisers was a good way to experience more. The Game Paté was huge, but more of a parfait in style being smooth, creamy and full of flavour, served with the traditional garnish of pickles and bread and a hefty dose of horseradish. The Lithuanian style dumplings with lovage were simply swimming in a delicious garlic butter, warm, and comforting and absolutely delicious. For the main course, I found it incredibly hard to choose between a number of local delicacies, but in the end, I plumped for the half roasted duck, simply based on the enthusiasm with which our waiter described it. I could not have been more delighted. Slow cooked, flakey and tender with a crispy skin, served stuffed with spiced apples and a plum sauce, there was more than enough to satisfy Heidi too, who was a tad underwhelmed by her breaded veal cutlets. Luckily she'd also enjoyed a local mushroom soup. Matching wine to such a robust selection of flavours and textures can be a challenge, though the wine list here has an interesting selection. They are clearly catering to their more famous clientele who will desire wines with cult status and price tags to match such as Vega Sicilia Unico... Luckily there are still a few bargains to be had. Intrigued to see for the first time a Beaumes-de-Venise AC red, I opted to choose this Grenache & Syrah based wine. The Southern Rhone appellation is more known for it's Vin Doux Naturel (Muscat de Beaumes-de-Venise), a sticky dessert wine. Here it expresses similarity in all but price to a Chateuneuf-de-Pape and I was pleased that we both really enjoyed the juicy red fruit flavours which complemented our dishes well. With such hearty fare, we were a little disappointed not to have room for dessert, especially as the descriptions were so lyrical and tempting, and included allusions to the dancing we'd be doing for the rest of the weekend. I'd love to have tried "Soup of Nothing": with clouds and red fruit, or, "Waltzing Hazelnuts": after this cake you will dance forever. But it wasn't to be. In total, the meal with mineral water and wine came to less than £110 for 2 which was substantially less than we'd been warned to expect, and we were full to bursting, and unable to dance for a couple of hours! The surroundings and story made us feel like we'd experienced a little gastronomic history. All in all, a success. If you've been following my blog for a while, you'll have noted that the Polish and Hungarians are rather fond of flavoured vodkas rather than wine. So it was that I sampled Soplica in both hazelnut flavour (reminiscent of Nutella) and raspberry flavour (a tad too sweet but certainly a delicious cocktail ingredient), as well as various citrus flavoured vodkas. However, as befits Purple Teeth, the highlight of my alcohol adventures over the weekend was a brand new wine, both country, and grape varietal. Georgian wine is probably not up there on your list of "must try" and I'd have been hard pushed to describe the importance of Georgia to the history of viticulture. Yet it appears the Georgians were among the first to make wine some 7000 years ago with archeological remains having turned up evidence of fermenting grape juice underground during the winters of 4000 BC! I've since learned that our word wine comes from the Georgian word "gvino" so it seems a bit of an oversight that I'd never before tasted a wine from this birthplace of my beloved beverage. I was unprepared for this to be a semi-sweet red. Certainly I couldn't understand a word of the label, and the branding suggested something quite aggressive, but this prestigious appellation is famed for it's reds from the late-harvested, inky-black Saperavi grape (another new one on me) which are vinified to around 12% abv with some residual sugar and aged for 2 years. Don't be put off by the sweet red description. This is not a port, nor a Banyuls in it's sweetness levels. Simply, the hint of sweetness provides a backdrop to a rather appealing bright berry or damson flavour with a smooth, mouth-filling texture, and a hint of spiciness. If you enjoy the richness of Amarone della Valpolicella or deep, high alcohol, old vine Zinfandels, then you'll probably enjoy this without thinking too much about whether it's sweet, dry, Georgian or historically important. If you're interested in getting to know more about Georgian wine, or to try a version of the type I tried, then UK based The Georgian Wine Society is ready to help you, with online sales and lots of historical background. I must thank my new Polish friends Karol and Kasia for introducing me to Kindzmarauli, a version of which is available from The GWS for £10.99 a bottle. I love having new experiences in wine and am hugely grateful that my West Coast Swing dancing hobby has brought me into contact with so many different cultures, people and opportunities to learn something new about how alcohol in general, and wine specifically. is enjoyed throughout the world. I have no more overseas trips planned for the rest of this year, so I'll be sharing what I've learned at a couple of tasting events, as well as experimenting with what's on my own wine rack. I hope that it inspires you to try something new too!